The Province of Ontario establishes the ground rules for land use planning through the Planning Act. Municipalities are given all of their powers and authority to act by the province. The Planning Act is used in most development applications while the Municipal Act governs matters such as street openings, street closings and street name changes. The City, at the direction of the Planning Act, creates an overall master-planning document called the Official Plan. The Zoning By-law is a companion document and a key tool in the implementation of the Official Plan. There are 14 types of Development Applications that are reviewed by the Planning Services Branch and the Committee of Adjustment. This type of application includes applications to modify the uses that are permitted on a parcel of land, the way in which a parcel can be developed, or to seek relief from a zoning provision. The Official Plan and the Zoning By-law regulate land use. This type of application includes applications to create new lots, or ownership units, or in the case of a common elements condominium, to create common elements that may not include the creation of any lots. This type of application includes those that may be required in order to proceed with a development on an existing lot that meets the standards of the Zoning By-law. Following a full and open decision making process, most decisions made by staff, City Council and the Committee of Adjustment can be appealed to the Ontario Municipal Board. The Official Plan and Zoning By-law are available online or contact 3-1-1 for further information. The City of Ottawa welcomes and encourages comments from the public and community organizations regarding the development review process. Community organizations have an important role to play in the process and can provide practical and useful insights into the potential impacts of the Official Plan and Zoning By-law amendments, of subdivisions, commercial and industrial site plans and other planning matters that occur in or near their neighbourhoods. Pre-Application Consultation with City staff is strongly urged for all potential Official Plan Amendments, (Major) Zoning By-law Amendments, Plans of Subdivision, Plans of Condominium (for vacant land or common elements) and Site Plan applications involving public consultation. At a meeting with the potential applicant, that could include external agencies, City Staff will review the types of application(s) and associated plans and studies required to support a proposal, and will confirm this by sending a completed Study and Plan Identification List to the potential applicant. The application is reviewed in detail by the assigned staff to ensure it is complete and all required items from Pre-consultation are included. Staff will advise the applicant if the application does not meet the requirements and if so, what other information is required. Target timelines for applications will not commence until the submission requirements and any information or materials required to process the application are submitted by the applicant. The assigned staff will contact the Ward Councillor and community organizations who have requested pre-consultation. A meeting may be requested with the applicant at this stage. The technical circulation and public notification of the application follows this notification but may be delayed until after the meeting to allow for changes to be made to the application. The package includes a brief description of the proposed development with a location map and plans where applicable. A period of 28 days from the date of the mailing of the notice is provided for comments to be submitted to the assigned staff. Applications for Site Plan Control Approval, under the delegated authority of the assigned staff; Part Lot Control with no public consultation; Lifting of 30 cm Reserves; and Lifting of Holding By-laws are only circulated to Ward Councillors and technical agencies. Comments are required within 14 days from the date of the notice. See individual development applications for timing. The sign remains on the site until a decision is rendered on the application. In certain cases such as a rural setting/greenfield area where a sign may not be effective, staff may complete a mail notice to advise the area residents/land owners of the application. Plan of Subdivision applications are legislated to have one public meeting. For other applications, the Ward Councillor or the applicant may request that staff hold a community information session to hear comments and concerns, provide technical clarification and to explain the development review process. Notice of the session is sent to the organizations and members of the public who provided comments at an earlier stage in the process. This notice may also include an advertisement in the local newspaper. At these sessions, the applicant and or the applicant's agents present details about the proposed development. Staff work with the applicant, Ward Councillor, community organizations and the general public to resolve any issues or problems identified with the application. Following this resolution, the assigned staff prepare either a Departmental Delegated Authority Report, in the case of delegated approvals, or a Departmental Committee Report for applications not under delegated authority or where delegated authority has been withdrawn: these reports establish the Department's position on the application. For Plans of Subdivision, Condominium Applications and Site Plan Control Approvals, under the authority of the General Manager (Director), the Delegated Authority Report, including the conditions of approval, is sent electronically to the Ward Councillor and applicant for concurrence before signing by the General Manager (Director) or their delegate. If the Councillor and applicant agree with the recommendation, the report is signed. For certain applications including Site Plan Control Approvals (under the authority of the assigned staff), Lifting of 30 cm Reserves, Lifting of Part Lot Control, Removal of a Holding Zone or Road Closures, the Delegated Authority Report, is signed without a requirement for review by the Ward Councillor. Notice of the decision is sent to the ward Councillor and to those who submitted comments on the application or who requested to be notified of the decision. For Removal of a Holding Zone, notice of the decision (Notice of Intent to Pass a By-law) is sent to every landowner to which the By-law would apply and to every person or public body who requested to be notified or it is advertised in Ottawa Community newspapers and Le Droit if the Holding Zone applies to a large geographical area and there are numerous landowners. Official Plan and Zoning By-law Amendments. The Statutory Public Meetings as required by the Planning Act will be held at the Planning and/or Agriculture and Rural Affairs Committee Meetings. Plan of Subdivision, Site Plan Control, Plan of Condominium and Part Lot Control and Road Openings when delegated authority has been withdrawn will also be held at the Planning and/or Agriculture and Rural Affairs Committee Meetings. A listing of the reports to be considered by the Committee is advertised in Ottawa community newspapers and Le Droit on the Thursday of the week before the Committee meeting. The Departmental Reports are also available via the City's Web site one week before the Committee meeting. 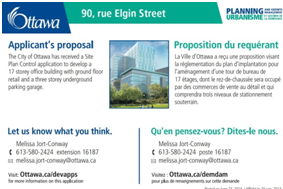 For site-specific Official Plan Amendments and Zoning By-law Amendments, notification by mail is used instead of a newspaper advertisement of the public meeting notice. For city wide or area wide amendments (either Official Plan Amendments or Zoning By-law Amendments) bilingual advertising will be undertaken in local newspapers. For Plans of Subdivision a public meeting is held in the community unless delegated authority has been withdrawn, in which case the City Committee will hold the public meeting. Notice of the application and of the public meeting will involve sending a notice to all property owners within 120 metres of the proposed subdivision, all affected community organizations and the posting of an on-site sign at least 14 days before the meeting. Staff may also place advertisements in the local community newspaper. Upon Council approval of conveyance price and concurrence by the applicant, the Intent to Close is advertised or the affected owners are notified. Once the Committee has made a decision on a development application that requires City Council approval, their recommendations are forwarded to City Council for a final decision. Since City Council may agree, amend or overturn the recommendations of the Committee, community organizations are encouraged to monitor the development application up to and including consideration of the matter by City Council. The City Clerk will advise the applicant of Council's decision. For Official Plan Amendments, all persons who requested to be notified or who made oral or written submission at the Committee will be notified of the adoption of the Amendment by City Council within 15 days of the Council passage of the by-law. They have 20 days to submit an appeal to the Local Planning Appeal Tribunal (LPAT). For Zoning By-law Amendments, if a by-law is passed by City Council, notice of the passage is undertaken within 15 days either by mail to landowners within 120 metres of the site, plus other persons or community organizations who made verbal or written submissions at the Committee or by advertising in the English and French newspapers. Twenty days are allowed for appeals. When the conditions have been cleared, the subdivision agreement signed and securities posted, the Plan of Subdivision is ready for final approval. The General Manager (Director) gives Final Approval and the plan is registered. Upon completion of the development, the owner may request an inspection for partial release of the securities. The balance of the securities will be released once the work has been completed to the City's satisfaction.